I took this shot for the “Pop of Color” theme in the photo a week group I’m in over at Flickr. As often happens, I put off doing it until the last day of the week and didn’t expend a whole lot of energy when choosing a subject. I looked around the room, grabbed the scissors with their turquoise handles, popped them into the lightbox (which was already setup to take nail polish photos), and snapped a half dozen or so shots, of which this was the best. I don’t have a passion for photography like so many of my Flickr friends do. For me, it’s a means to an end, a way to document experiences and accomplishments and possessions, not an end in itself. I’m not about making art with my camera; I’m just happy if I can get a clear picture of whatever I’m aiming at. I don’t look at this photo of my scissors and think of how I could have focused or lit or composed it differently. 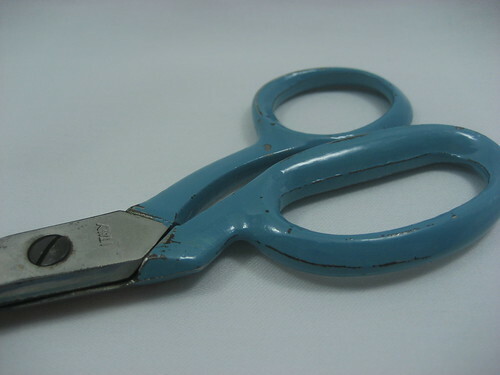 I think about how I’ve had this pair of scissors since junior high school, when I took home ec, and a sewing scissors was on the supply list. All girls took home ec back then, to learn to cook and sew. Boys took shop, to learn to use power tools and build things. I don’t remember having a choice. I don’t regret taking home ec, and even still use some of the things I learned. Well, one thing that I can think of at the moment: on the rare occasions now when I bake, I make a well in the dry ingredients before adding the wet ones to the bowl. I don’t remember why it’s supposed to be done that way, though, so maybe I didn’t retain all that much. At least I got a good sturdy pair of scissors out of the experience. They went with me to my first real job, nestled in my briefcase. Now they live in the home office I share with Mr. Karen, still cutting after all these years.